In a nutshell: Oneuli Black Sand Beach is an excellent beach for snorkeling & diving. It is also packed full of educational value for naturalists & geology buffs. Minuses: Not the best “basking-and-bathing” beach. 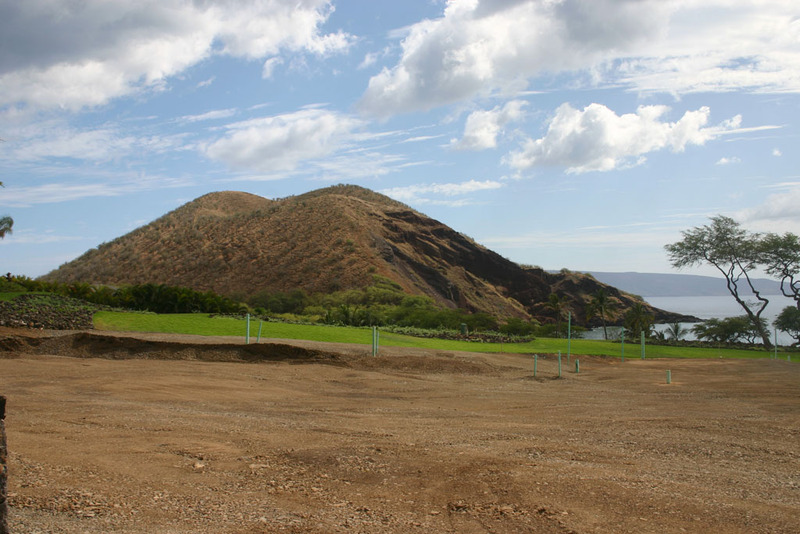 Part of Makena State Park, One’uli (also called Naupaka Beach) is found on the Wailea side of the Pu’u Ola’i cinder cone, a prominent geological landmark feature which can be seen from points up and down the coast. Appropriately, oneuli means “dark sands” in Hawaiian. While this is the closest black sand beach to the resort areas, most visitors (and many residents) only associate black sand with Wainapanapa State Park. Unlike typical beach sand, which is make up of ocean-ground coral and shells, black sand is made up of ground lava. 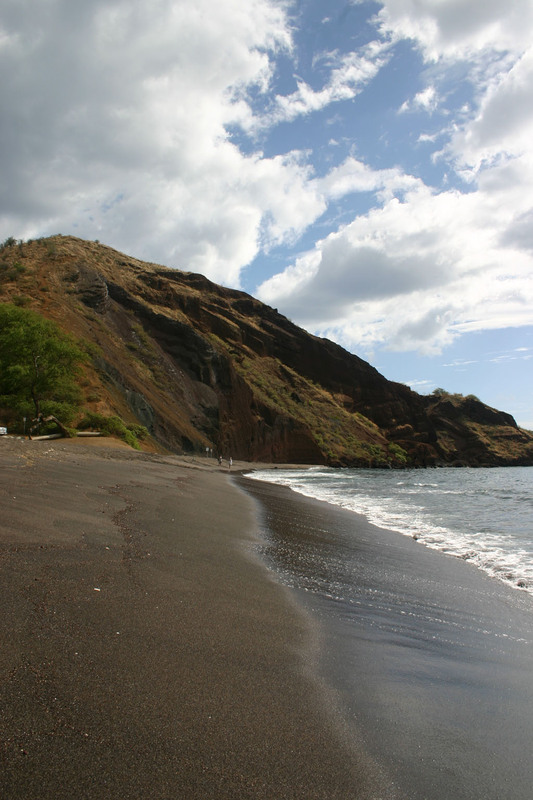 On this beach, the geologic story is laid out right before your eyes; the sand is ground from a giant cross-section of the pu’u that has been dramatically cut away by the ocean. Besides clearly illustrating how the sand came to be, the exposed layers of cinder and lava also provide an unusual opportunity to view the makeup of a cinder cone. The beach is covered in a thick blanket of black sand, but at the water’s edge the sand abruptly disappears and becomes hard lava. Lack of sand-entry into the water makes this a not-so-good beach for casual bathers, but for what this beach lacks in “basking-and-bathing”, it makes up for in snorkeling. Coral and reef are found just past the water’s entry. Coral equals abundant sea life. Green Sea Turtles also frequent this area. Pu’u Ola’i means Earthquake Hill. According to oral Hawai’ian history, it was the next-to-last place to erupt. The pu’u is told to have formed in the 1700’s, explosively, in about a week’s time. However, Hawai’ian history is not known for precise accuracy – especially when dealing with time. Hawaiians had no written language, and “our grandparents time” could very well mean many more generations than the actual story teller’s literal grandparents. This area is also at the edge of the Maluaka Wetlands, this section of the wetland is called the North Pu’u Ola’i Wetland and has been the recent focus of restoring a historic fishpond not far from the beach. Informational signage has been installed in the parking area to explain what is being done, giving insight into several aspects of this protected area, including descriptions of some of the endangered birds you may see. Additionally, there is a trail which goes to the top of the cinder cone. The hike is not exactly an easy stroll for the less fit, but there are great views from the top. whats the name of the volcano there I need to now for a project. Was a wonderful surprise..we really thought it was super cool and very different…tons if shells 🐚 .. and sea turtles….a very special place…a bit mysterious as well..a must see..let the black sand run through your hands ..so soft.. Went to this beach last week and it was great! The kids loved the black sand. We missed the turn off – it is a dirt road right before one of the more established turn offs to Makena Beach (I think). Very short dirt road. The food trucks parked in the area made for a nice treat. Was there last week, snorkeled with the green sea turtles, my first encounter and close to shore. Also spotted a rare Monk Seal sleeping on the beach ~ I understand they are endangered and was sure to give them atleast 20′ of space. One of my favorite experiences in Maui! Was just here a few days ago…the beach was beautiful! We rode bicycles there so the short dirt road in was nothing. There were a few locals on the beach and a few tourists. The waves were pretty big so I was nervous about going swimming but it was definitely a beautiful sight to see! …..not exciting at all??? no way it’s gorgeous! Gorgeous beach. You don’t need a jeep. The road is not that long and I drove it in a compact car. Visited the black sand beach this afternoon and it did not disappoint. The bumpy road in started the adventure off right! BTW- jeep recommended. Just visited to see the sand and check out the sights. We were greeted by a nearly empty beach where the kids roamed endlessly finding oodles of shells!! A true surprise that pleased us all. We were just at this beach today and it was mostly deserted. Not a fan of crowds, it was a nice respite from the throngs at Makena Beach. Be warned the surf here is not for little ones without adult supervision and the sand back from the beach is super hot. Walking along barefoot in the surf and soft cool sand was nice though. The cliff face on the one side of the beach is not very stable so I would be careful walking in that area.